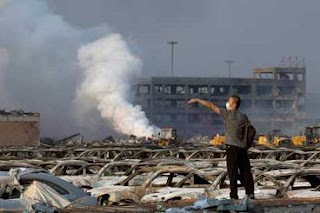 Authorities in Tianjin say massive explosions and fires this week at a warehouse for hazardous materials have so far not caused any detectable air or water contamination, citing samples taken at 17 locations. However, they say they have no clear picture of what materials were at the transit warehouse at the time of the blasts, because the materials were in temporary storage and the site, owned by Ruihai International Logistics, was badly damaged. Fire and other officials so far have reported detecting calcium carbide, potassium nitrate and sodium nitrate at the site.